Almost 90,000 KM from the budget reserve went to office holders or their children for medical treatment and education. Enes Salkanović, a legislator with the Federation of Bosnia and Herzegovina (FBiH) House of Peoples, received 7,000 KM from the budget reserves, money that is supposed to be earmarked for emergency and unanticipated events such as floods, earthquakes or fires. Over the past four years, money came from the budget of the Municipality of Odžak, Posavina Canton and the FBiH, that is from all the various levels of governance in which Salkanović participated as a legislator. 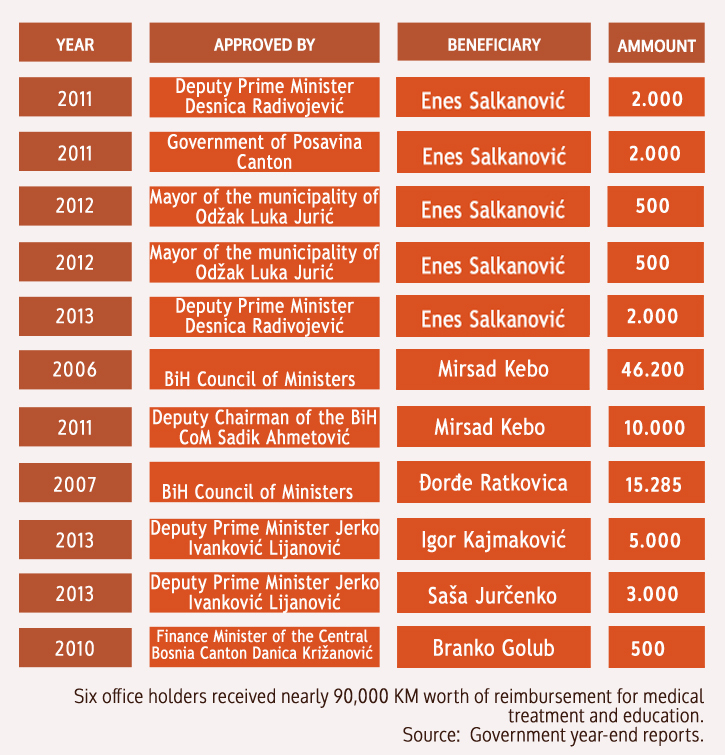 According to an investigation by the Center for Investigative Reporting in Sarajevo (CIN), almost 90,000 KM from the budget reserves went for medical treatment of officeholders, politicians or their children. The prime ministers or their deputies who have discretionary right over the fund signed off on the money for Salkanović and five other persons. Salkanović joined the legislative branch in 2004. Since then, his income has varied between 1,000 and 4,000 KM depending on the level of governance he was at. He told CIN that he learned about the budget reserve funds from colleagues, including then a fellow party member Desnica Radivojević in the Party of Democratic Action (SDA). As a deputy to the FBiH Prime Minister he had discretion to give away some budget funds. “I talked with him on one occasion and he told me: ‘Well, now, you can ask me as well,’” said Salkanović. And so he did. In 2011I and 2013 he got a combined 4,000 KM from Radivojević. The deputy prime minister said he could not recall how Salkanović got that money. Meanwhile, Salkanović received another 2,000 KM from the government of Posavina Canton’s budget in mid-2011. That came from a fund for those in need of welfare and health assistance. He told CIN that he needed the money for treatment following a colon cancer operation. He was buying Avastin, a drug that slows the growth of new blood vessels which feed a tumor. “I received a total of 18 of them, and the price of one of them is €2,000”, said Salkanović. He added that he was moving to Sarajevo and the FBiH Parliament at the time, so he had to wait three months for a salary. “Odžak is a small town. It can fit between two bars, so everyone knows what goes on and there is no lack of transparency,” said Jurić. At the time Salkanović received 1,000 KM, his fellow resident Zekija Mrkanović also got a grant for medical treatment. She lives in a house without electricity, water and windows and she got 50 KM from the reserve. Jurić does not know her. FBiH Vice-president Mirsad Kebo received a 56,200 KM grant for medical treatment. Kebo has undergone several surgeries over the years—46,200 KM was allocated from the state budget money for his treatment in 2006. The decision to cover the cost of medical treatments came from his then SDA colleague Adnan Terzić, who was the state prime minister at the time. Kebo was then the BiH minister for human rights and refugees and received a monthly salary higher than 2,000 KM. He now earns 3,200 KM a month. Another person whose medical treatment the state budget covered was Đorđe Ratkovica, director of the State Bureau for Civil Aviation.According to a decision passed by the president of the BiH Council of Ministers Nikola Špirić in 2007, Ratkovica got 15,285 KM to cover medical costs for a heart condition. . He told CIN he went to Institute Dedinje in Belgrade for the treatment, but that he did not ask for money. Instead, the BiH Ministry of Traffic and Communication did it on his behalf as the bureau is one of its agencies. “I don’t know how much the operation cost. I think €1,000. 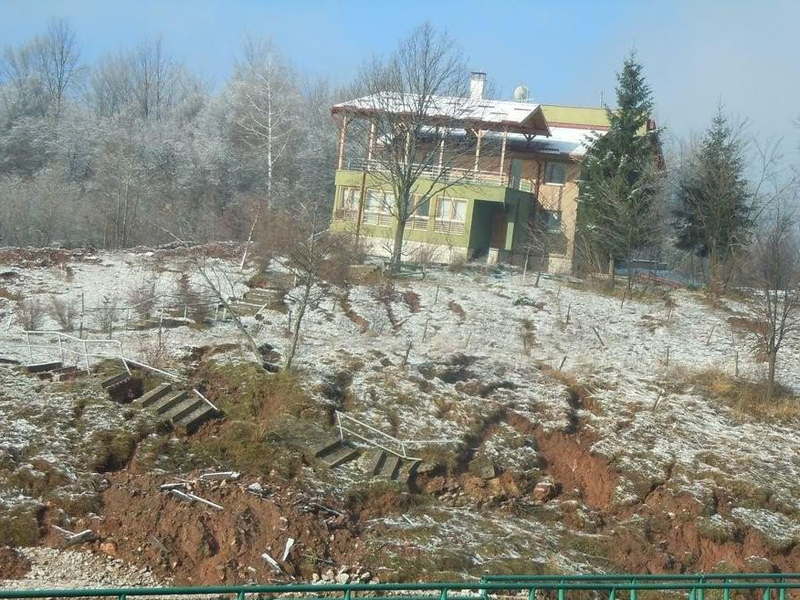 And then the costs…”, said Ratkovica. In comparison, it took three months and the support of a bank last year for the Open Network Association—which collects money for the medical treatment of BiH citizens—to raise 18,000 KM. With that money the group helped pay the medical treatment for three persons abroad. Asad Harbić got help from the Open Network. He underwent a bone marrow transplant at a clinic in Tibingen, Germany. The operation cost nearly 350,000 KM, so he asked for help from the budget reserve. His family tried many sources for help, attaching the clinic’s invoice as proof of need. Only the FBiH authorities responded to their pleas deciding on their own how much to give Harbić. “We got 500 KM from Nikšić and 1,000 KM from Desnica Radivojević“, Harbić told CIN. The FBiH budget with 3.000 KM also partially covered the costs of Saša Jurčenko’s operation who is the director of a Bijeljina-based Red King LLC and a regional representative for the People’s Party Work for Betterment. He told CIN that his heart operation cost around 30,000 KM. He said that he had not been receiving a salary as the party’s representative and that he turned to many for help. The party’s vice president Jerko Ivanković Lijanović helped him out with the FBiH budget money in his capacity of the vice-prime minister by signing off on the reserve money. “And then he told me: send a letter with all documents—the hospital discharge and all—to the Office of the Prime Minister so we can see if we can help you and find some little money for you,” Jurčenko recalled of conversation with Lijanović. He said that his connection with the vice-president was not through the party but through business, and it’s been a long one. “I have a private firm that deals with paprika. I am on good terms with Jerko…I’ve been in the party for two years and I’ve worked with paprika for 20,” said Jurčenko. 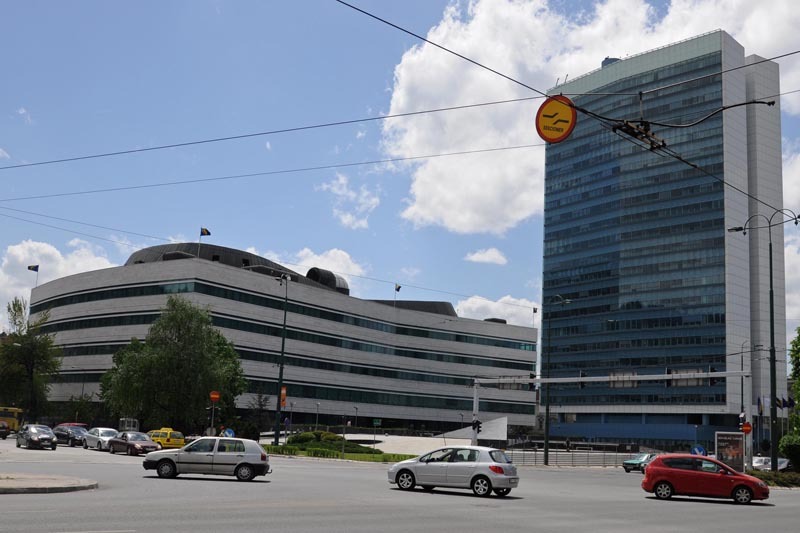 The office of the FBiH Vice Prime-Minister Ivanković-Lijanović did not respond to a CIN’s request for documents about spending. Since 2011, when he took over the post of the deputy Prime Minster, Ivanković-Lijanović has given away more than 33,500 KM from the liquid reserve to 29 members of his party and their families. Among them is Igor Kajmaković, son of Siniša Kajmakovića, the party’s legislator from Bijeljina. He received 5,000 KM for his education. Siniša Kajmaković told CIN that his son did not want to ask for money, but that the family had no other option given the hard times it had fallen upon. “I asked for help and the money used his discretion. I asked him directly, it’s true,” said Kajmaković. He owns a music distribution company Renome in Bijeljina. He told CIN that the firm went belly-up because of hard times and his political engagement with the party. The family has no income. “We will give back the money, because the money came on my insisting for help. You’ll see that miracle that someone who got money from the budget paid back,” said Kajmaković. The laws on the execution of budget in BiH do not stipulate any obligation to return money given from the liquid reserve. The only obligation of a beneficiary is to spend it in accordance with the stated reason. 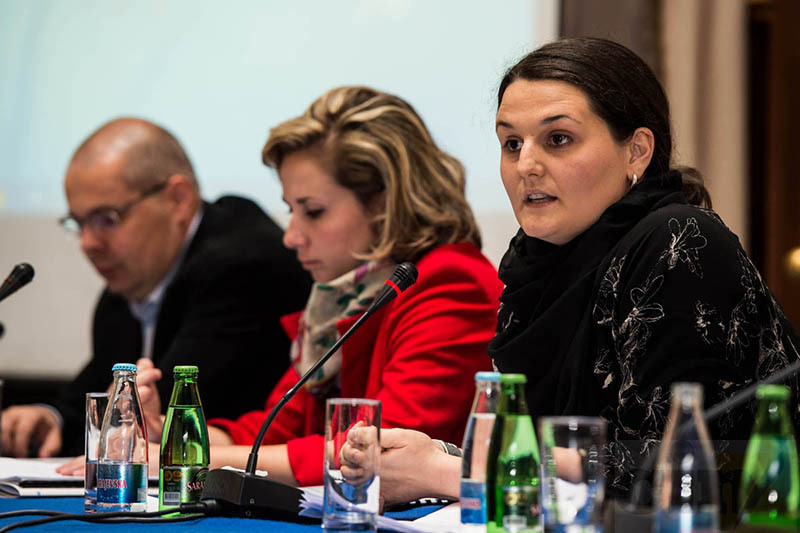 The finance minister of the Central Bosnia Canton (SBK) Danica Križanović approved 500KM from the budget reserve for continuing education of her colleague from the Croatian Democratic Union (HDZ) party Branko Golub in 2010. At the time he was 56 and attending master studies at a Mostar School of Humanities. Golub told CIN that he neither received the money nor he asked for it and that he did not know why the Cantonal Report on the Execution of Budget Reserve mentioned him receiving money. “I have never asked for the money from the reserve because I know where it can be gotten from,” said Golub explaining that he had asked for the money for his degree from party colleague Greta Kuna, the then Cantonal Minister of Education, Science, Culture and Sport who succeeded Golub in this post. He asked her for 2,000 KM, but said he never got it , because the media wrote about his request and the minister Kuna “probably fretted”. For this reason, he has never started to work on his dissertation nor has he defended it. “I have not defended it. I did not want to defend it (a dissertation) because no one was found to to give me a hand…I simply got angry and I did not want out of principle. Later I did not see the point in it. What do I need it for?” said Golub who retired during his masters studies. Branko Golub was the Canton’s prime minister 15 years ago. In 2006, he was sentenced to six months in prison for abuse of office after he wired 45,367 KM from an account of Croatian Union of Herzeg Bosna’s Chamber of Commerce to an account of HDZ BiH Cantonal Board in the Canton. He never served any time. He changed his residence several times to delay execution of the sentence until he was pardoned in 2009 by his party colleague and the then FBiH President Borjana Krišto. Other BiH students have an opportunity to get scholarships from the state. However, the procedure is more complicated than sending one request. One student from the Central Bosnia Canton had to attach up to 24 documents for a one-time grant of 1,000 KM. He had to pay for all the documents and their certification. Nearly 97 million KM from the budget reserve has been given away in the past four years. All budget laws in BiH read that this money is to be given only for emergency and unanticipated events, but there is exact definition. This leaves it up to the ministers and mayors to decide. The money from the reserve is allocated in two ways: through a government collective decision and in the case of Brčko Disktrict, by its Assembly, and by Ministers’ discretion. This discretion at the state level was introduced in the 2007 Law on Budget when Nikola Špirić headed the government. On the basis of this, the chairman and his two deputies got an opportunity to decide unilaterally whom to give 4 percent of the budget reserve. Thus, Vjekoslav Bevanda, Nikola Špirić and Zlatko Lagumdžija disbursed 114,026 KM last year. The FBiH Prime Minister and his deputies, as well as the Republika Srpska Prime Minister and Finance Minister have the same right. According to records that CIN has collected and published, 14 state and entity ministries have distributed more than 3.2 million KM in the past four year. The state auditor Miro Galić told CIN that auditors are struggling with undefined and unclear legislation on the spending of budget reserve. “You don’t have a clear and precise rules and that leads to subjective way of distributing funds,” said Galić. He said that a discretionary right is a controversial category, but legal.